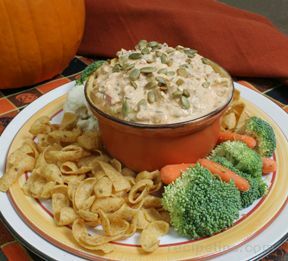 Creamy and spicy pumpkin dip, perfect for your Halloween get together. 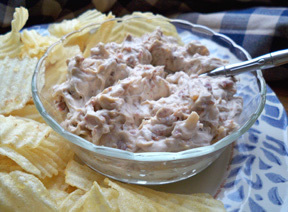 Turkey is one of the ingredients in this dip, making it a great appetizer to serve at Thanksgiving. 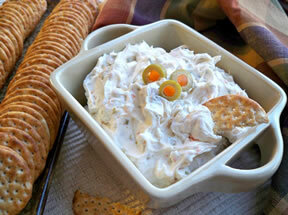 You can also learn how to roast pumpkin seeds to use as a garnish with this pumpkin dip. In a large mixing bowl, beat together the cream cheese, sour cream, canned pumpkin, taco seasoning, and garlic powder until smooth. Stir in turkey, onions, red peppers, black olives, and jalapenos. Serve in a pumpkin cut in half and hollowed out or a festive dish. Serve with vegetables or corn chips. 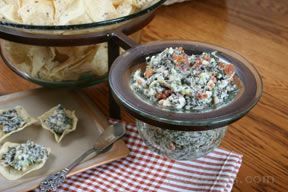 "This dip was awesome! It is perfect to serve anytime throughout the fall and the holidays. Can't wait to make it again."